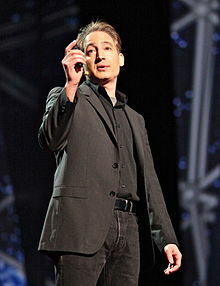 Brian Randolph Greene (born February 9, 1963) is an American theoretical physicist, mathematician, and string theorist. He has been a professor at Columbia University since 1996 and chairman of the World Science Festival since co-founding it in 2008. Greene has worked on mirror symmetry, relating two different Calabi–Yau manifolds (concretely, relating the conifold to one of its orbifolds). He also described the flop transition, a mild form of topology change, showing that topology in string theory can change at the conifold point. My view is that science only has something to say about a very particular notion of God, which goes by the name of 'god of the gaps'. There's a picture of my dorm room in the college yearbook as the most messy, most disgusting room on the Harvard campus, where I was an undergraduate. Science is the greatest of all adventure stories, one that's been unfolding for thousands of years as we have sought to understand ourselves and our surroundings. My view is that you don't tell the universe what to do. The universe is how it is, and it's our job to figure it out. I think the relationship between memory and time is a very deep and tricky one, to tell you the truth. I don't consider memory another sense. I do consider memory that which allows us to think that time flows. For me it's been very exciting to contribute to the public's understanding of how rich and wondrous science is. Even when I wasn't doing much 'science for the public' stuff, I found that four or five hours of intense work in physics was all my brain could take on a given day. It's hard to teach passionately about something that you don't have a passion for.